LONDON: A 3,000-year-old carved stone tablet from Babylonia, said to place a curse on anyone who tries to destroy it, is to be flown home from Britain after being looted during the Iraq War. British Museum director Hartwig Fischer handed over the priceless work to Iraqi Ambassador Salih Husain Ali during a ceremony on Tuesday after museum experts had verified its authenticity. The attempt to smuggle the piece into Britain was thwarted by the UK Border Force at London’s Heathrow airport in May 2012. It had been declared at customs as a carved stone made in Turkey and valued at $330. But when the package was opened it caught the attention of a Border Force officer who recognized that the declaration was false. After a long investigation against the importer, the case was resolved in favor of Iraq, with coordination from the British Museum, which acts as the specialist adviser on cultural property for the British government. It is still not clear how the object was taken out of Iraq, “but we believe it was probably stolen about 15 years ago during troubles in Iraq,” Ellis added. 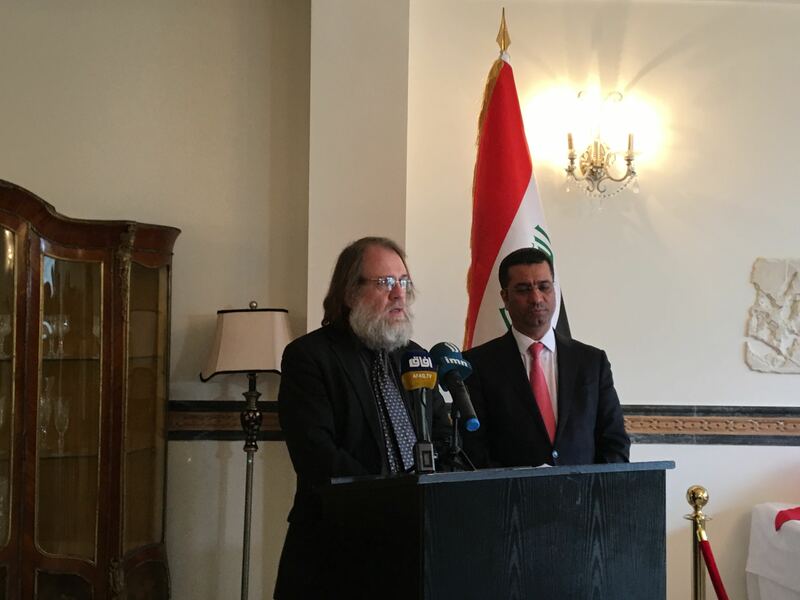 Ambassador Ali said the handover came after continued cooperation between the Iraqi embassy in London and the British authorities, including the Foreign and Commonwealth Office, the British Museum and British police. 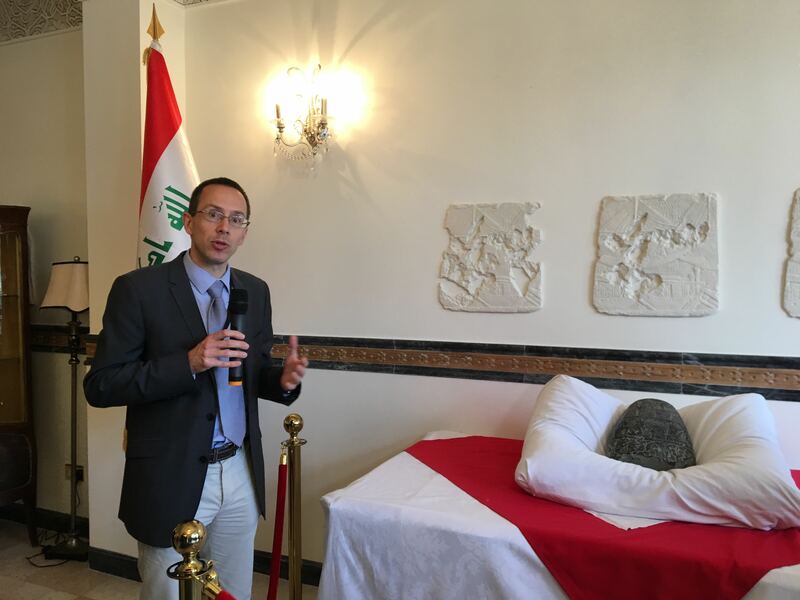 “As a representative of the Iraqi government, I am looking to receive more handovers in the future if any Iraqi antiquities are found here,” Ambassador Ali told Arab News. 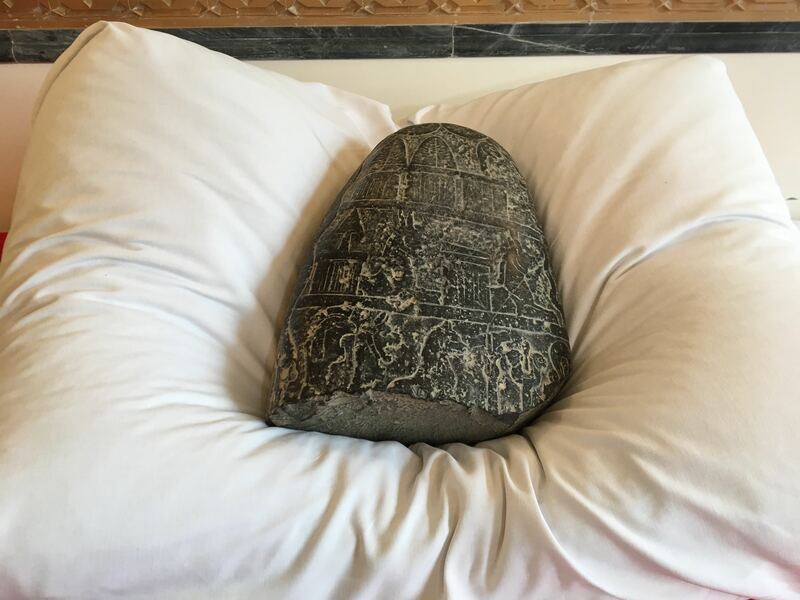 He said from the contents of the inscription it appeared the piece came from Nippur, which was a big ancient Sumerian and Babylonian site in southern Iraq. It was heavily looted in 2003 and the museum believes the object came from that phase of destruction of a known archaeological site. Taylor added that the inscription says that the great god Enlil, the father of the gods, came up with a plan to save the day, so he created Nebuchadnezzar as the avenger of the Babylonians and the brave king marched into enemy territory, defeated the Elamite, took the statue back, brought it to Babylon and order was restored. “The gift is designed to last forever and there are a list of curses or protective formulas so if anyone should come along and dispute that the gift was made or if they try and hide it, bury it in the dirt, try to destroy it with fire, smash it or get somebody who does not know any better to do it on their behalf, then the gods will curse them in a variety of really horrible ways. So, it is to protect forever this gift in recognition of this act of bravery,” said Taylor. Fewer than 200 such objects are known to exist, and the one handed over on Tuesday was broken and eroded, presenting a problem for sleuths trying to establish its history. This is the second handover so far on such a significant level. Eight antiquities were given back to Iraq seven months ago from the British Museum and it is investigating other cases of material coming from Iraq that will have to be returned. “We would like to reboot our bilateral relations in many fields not just on the humanities side, but we are getting good support from our friends and through the global coalition to defeat terrorism in Iraq, especially Daesh,” said Ali. 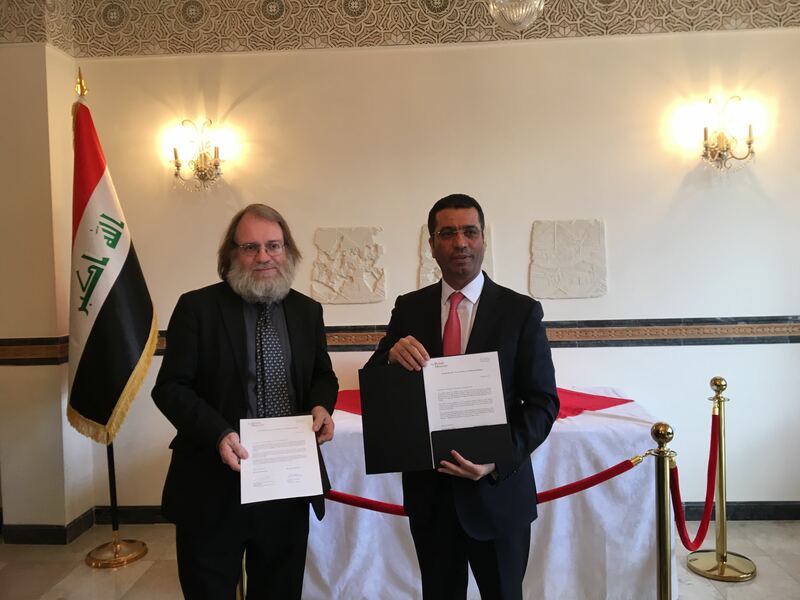 The initiative is part of a wider Iraqi scheme between the British Museum and the State Board of Antiquities and Heritage of Iraq (SBAH) in Baghdad. 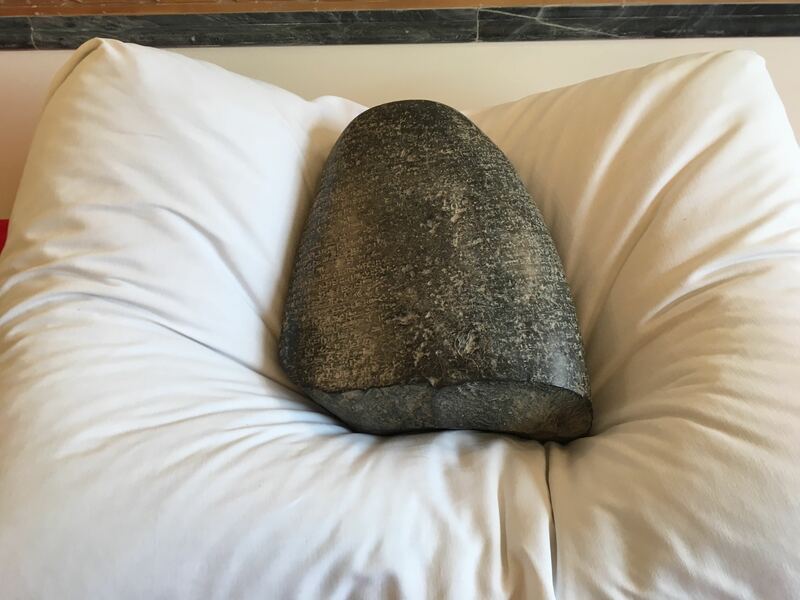 The scheme was initiated by Jonathan Tubb, keeper at the museum, in 2015 following the dreadful destruction of places such as Nimrud, Nineveh and Hatra, all in the Mosul region. “It was quite clear that we couldn’t do anything on the ground, I mean nobody could get into that region and it would have been foolish to do so,” Tubb told Arab News. The scheme introduced a constructive method of training SBAH employees in all the techniques they would need to confront the aftermath of the destruction, enabling them to work methodically and systematically from day one to record and excavate what was left. They are trained in surveying, photographic and field archaeology techniques, as well as drone technology and have two excavation projects in Iraq, one in the north in Iraqi Kurdistan and one in the south at ancient Girsu (modern Tello). “By the end of this scheme of which the first phase will be finished next April, we will have trained 50 employees altogether and they will go back to their various departments and train other people so there will be a drip-down effect of the expertise,” said Tubb.